This post is part of the series in Book Recommendations by Age and Month of the Year. It has February book recommendations for children who are 4 years old. Each book is paired up with additional resources that you can use to extend the story further. The admirers of Fancy Nancy series by Jane O’Connor know that every book in this series is pink, glittery, and perfect for Valentine’s Day. However, Heart to Heart also has a cute Valentine mystery story to go with signature illustrations by Robin Preiss Glasser . I sort of hope that most 4 year olds are not too concerned about having secret admirers, but they will enjoy following Nancy trying to find out who her secret admirer is. 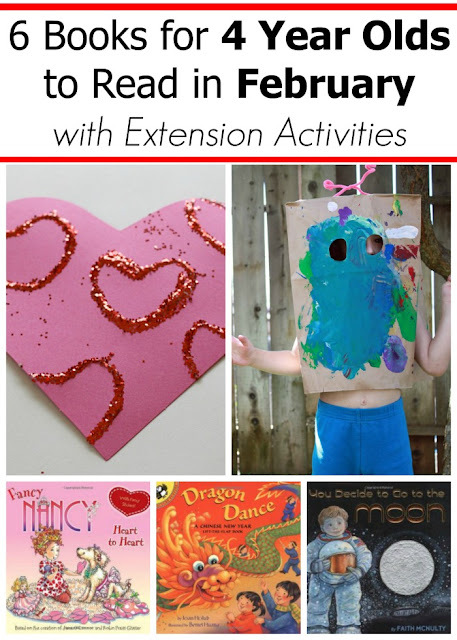 And, of course, the perfect extension for this book is to make some Valentine cards. These glittery cardboard roll heart stamps from Buggy and Buddy look like a great way to recycle and enjoy some art at the same time! Even older preschoolers like flap books, and Dragon Dance also has beautiful illustrations by Benrei Huang, and easy rhymes by Joan Holub introducing Chinese New Year celebration to kids. Dragon masks and puppets are an integral part of this celebration, and you can make your own simple dragon puppet with these dragon puppet instructions and a free printable from Red Ted Art. Have you heard of Great Backyard Bird Count or Big Garden Birdwatch? UK bird counting event is in late January, while Great Backyard Bird Count is in the middle of February. Get your children involved, read a wonderful book Birds by Kevin Henkes and observe birds in nature. 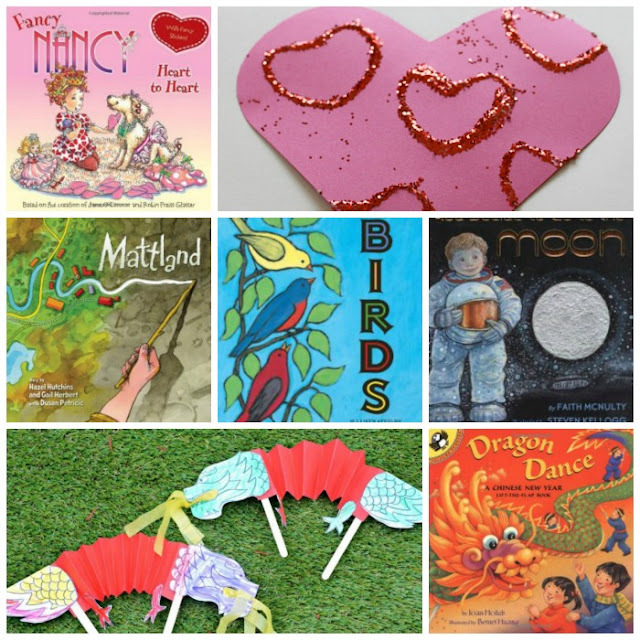 And if you and your children want to get crafty, pick one of these fantastic bird crafts recommended by Artsy Craftsy Mom. There are holidays that are celebrated by all of us, and then there are other kinds of holidays. Often those unexpected and obscure holidays leave most lasting memories in children. In Mrs. Muddle’s Holidays by Laura F. Nielsen the main character makes the life of neighborhood kids brighter by inventing her own holidays and making kids part of her celebrations. My daughter loves our tradition of looking up special days of the year on the Internet and celebrating them. Check out our Teddy Bear Day celebration from when she was 3 year old and read on how you could celebrate every day of the year at Real Life at Home. I highly recommend If You Decide to Go to the Moon by Faith McNulty to every boy and girl who ever wondered how it would be to travel to the Moon. It’s a great addition for any preschool or elementary school moon unit. Illustrations by Steven Kelogg are gorgeous, and they really capture beauty of both Earth and space. One warning – the book might be a little long for kids with short attention spans, but I think these wiggly kids will still enjoy looking at the pictures. Learn Play Imagine has a great learning unit on moon with variety of activities – I especially liked these pretend helmets. Mattland by Hazel Hutchins celebrates imagination. Children in this story transform a muddy plain into a fantastic playscape using mostly natural materials. Interestingly, there are no adults in sight offering them “invitations to play” – which is a good lesson for parents reading this book. It’s amazing to see what the kids can come up on their own just using natural materials when they are left to their own devices. Check out this great post on building with natural materials at The Imagination Tree. Do you have a favorite book about Chinese New Year? I love Stephen Kellog's illustrations, they always make me smile. Chinese New Year books, we found a few last year on the zodiac that were good, but I can't remember the name off hand. I love that dragon puppet craft that you linked to!